The 2011 Sea TURTLE teen diving expedition is back in Boston. 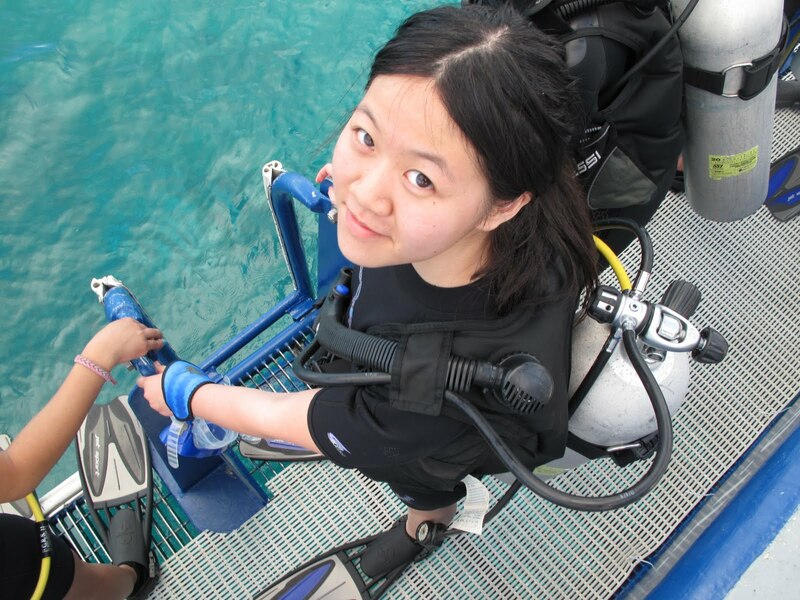 In this post, Lee shares her final thoughts on her experience with the program. I learned the most about myself during the night dive at the Sapona wreck. It helped me see that I am much more capable than I give myself credit for. I worked really hard, through doubts, lack of confidence and swimming ability to acquire the experience that I value as one of my greatest accomplishments so far. My perspective on the oceans has also become more firmly established. We know that the oceans are one big mass of water, connected to each other, but looking out at Boston Harbor, you would never imagine they connect to the warm waters of the Bahamas and their coral reefs. Although the habitats are extremely different in warm tropical waters versus the colder New England waters, when it comes down to it, the basic make up of life in the oceans is still the same. Microscopic plankton are everywhere and they grow up into different species depending on their ancestors' adaptations to their environments but that doesn't change the fact that a Caribbean spiny lobster and an American lobster are all crustaceans that reside in the ocean. They are different species but are ultimately interconnected by similar traits and adaptations. 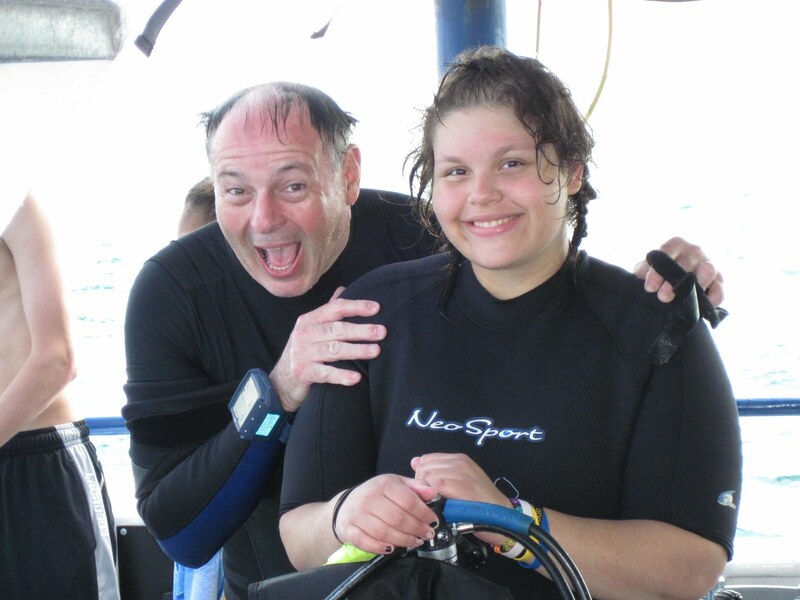 Lee and our dive instructor Sarah on the way to the Sapona! After personally traveling the entire way via plane and boat (for the first time) from Boston to Bimini, it has become a much greater realization to me that the ocean is indeed one great body of water that is shared with the entire world. The responsibility for taking care of it therefore should also be shared with the entire world. Just because Boston isn't anywhere near a coral reef, doesn't mean that the carbon dioxide we emit here won't contribute to the coral bleaching taking place in the corals down there. We all need to share in the responsibility of caring for our oceans and the first step in accomplishing that is to admit that we need to take our own responsibility for it first. Otherwise, there would be no way to spread the sentiments to others. Being a part of Sea TURTLE and living on the boat surrounded by the oceans for ten days has given me a much greater appreciation for the natural beauty of the water and all the life that resides in the world beneath it. I, in turn, feel much closer to the ocean and have a greater desire to present, promote and protect it. The 2011 Sea TURTLE teen diving expedition is back in Boston. In this post, Jessica shares her final thoughts on her experience with the program. This program has been an emotional rollercoaster ride for me but it was totally worth it! When I was sick, I had to sit out during the pool sessions even though I really wanted to continue the class. My body just didn't want to cooperate. 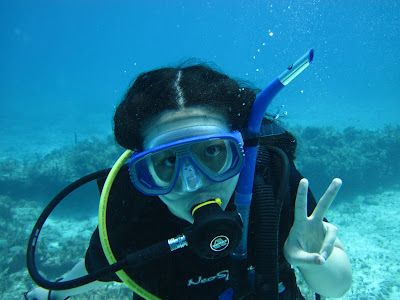 Even though I didn't get to SCUBA dive as much as I wanted to, I still got to dive! In the BAHAMAS! How many people get to do that in their lifetime? I learned that we are all connected. My carbon footprint is impacting marine life all over the world, not just the Bahamas. The excess energy I waste and the trash I throw away that ends up in the ocean is negatively impacting the ocean world. If I can make smarter, greener/bluer decisions (and encourage other to do so as well), I can protect the life I saw in the Bahamas. I want my children to be able to dive the sites I saw and see it even healthier and more beautiful than the way I saw it in April. Jessica and Christian after a successful plankton tow. I really feel like I'm part of the ocean after this experience! Seeing everything up close just gave me a greater appreciation for marine life. SCUBA diving gives you a more intimate relationship with the ocean. I'm even considering majoring in marine biology in college now... See what you've done, Sea TURTLE! 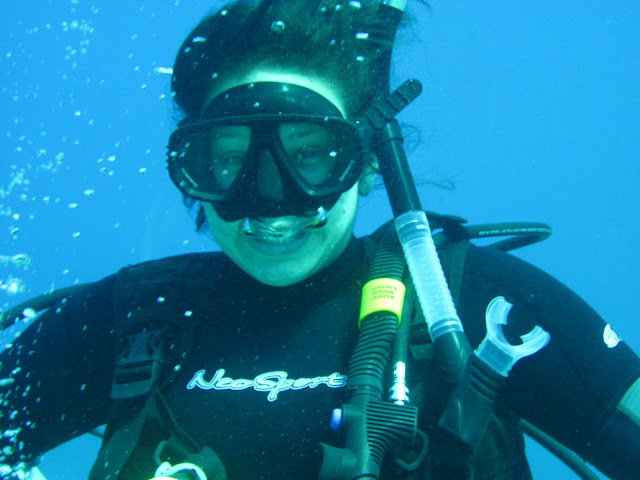 The 2011 Sea TURTLE teen diving expedition is back in Boston. 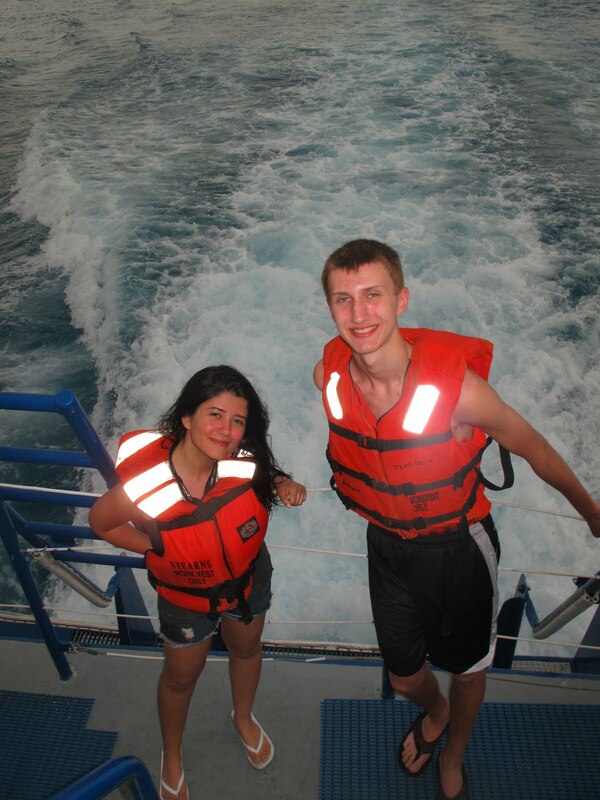 In this post, Christian shares his final thoughts on her experience with the program. My life in Massachusetts is very hectic and busy with all the work I get from school, making sure that I get good grades and hope I get into collage and then get a job. In the Bahamas juvenile organisms kind of share a similar life style in the sense that until they are adults they have to struggle to survive. A lot of the plankton we saw from our tows were small invertebrates and the larvae of different animals. Most will get eaten and never reach adulthood. And we think that we have it tough! Sometimes artificial reefs like the Sapona act like an oasis in the desert by creating new habitats for animals that would have no where else to live in the area! The 2011 Sea TURTLE teen diving expedition is back in Boston. In this post, Michelle shares her final thoughts on her experience with the program. After diving and exploring the Bahamas, I realized that the ocean is different everywhere we go. View of Michelle in the salon with the Sapona wreck in the background. Talk about a meal with a view! There is a huge variety of life found in one place and the next. Each individual animal in an ecosystem depends on another one to live. I also learned that the entire Earth is connected. 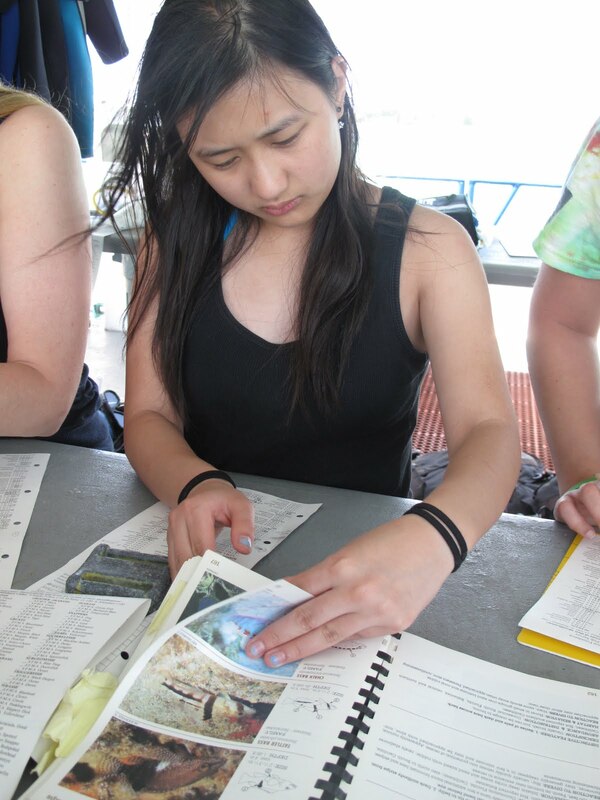 Identifying the animals that we saw during our dives. There were a lot of them! Every time I decide to drive or take a long, hot shower, I burn fossil fuels. This adds more carbon dioxide to the air and this causes the ocean to become more acidic as it absorbs it. Animal and plant life everywhere in the ocean becomes affected. #80: What's Happening - Real live reptilian sea turtles! Time for our Giant Ocean Tank (GOT) biannual sea turtle exams yet again. All four individual turtles, representing 3 of the 7 species in the world, were pulled, examined, weighed and returned to the GOT. They include Carolina and Retread, both loggerheads, Ari the Kemp's ridley, and of course Myrtle the green sea turtle. These exams are very important for the overall health of the sea turtles. 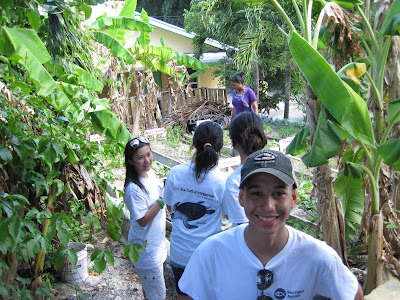 They are also a fun and educational experience for our volunteers, especially our college interns. Shown in the picture above, Wally, one of our four summer interns, helped me hold Retread up so that the veterinarian could get a good look at her underside, known as the plastron. I'm happy to report that all are healthy! 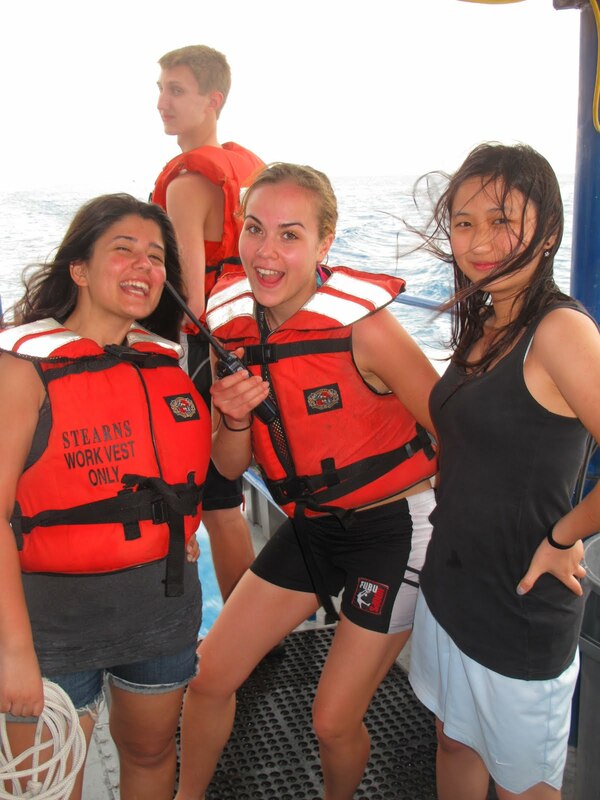 The 2011 Sea TURTLE teen diving expedition back in Boston. In this post, Dina shares her final thoughts on her experience with the program. I was constantly learning new things about myself throughout the whole program. At first I was a little nervous at the thought of living on a research vessel with 10 other teens, so far away from home with no technology. Throughout our days in Bimini on the boat I started to feel completely comfortable in my surroundings. I realized that I could take four minute military showers, sleep in an extremely tiny room, be with the same people for 10 days and absolutely love every minute of it. Lulu, Porshai and Dina during our visit to the Bimini All Ages School. I also learned that I don’t give up that easily. Being sick for a couple of days on the trip really brought me down, but I looked at the positive side of the situation and decided that it would be better for me to miss a few dives rather than risk it and never be able to dive again. Sarah pointing out the massive coral formations that give this dive site its name—Greenheads! Because I work in the Aquarium Dive Department on Sundays, I get the opportunity to see all the inhabitants in the Giant Ocean Tank every week, but it was really amazing to see them in their natural habitats while diving in the Bahamas. Seeing the fish swim by you and being able to identify it was the best way to learn about it. 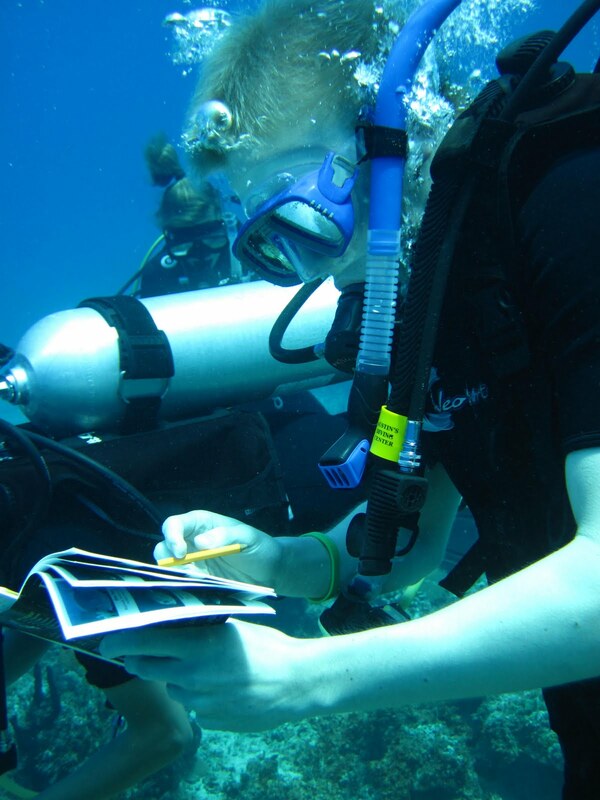 Homework underwater? During our REEF fish survey at Greenheads, we counted more than fifty species between two dives! Talk about biodiversity! Also, we may not think that some of the things we do in our daily lives affect the ocean and the animals, but they do. On this trip, I became more educated about marine habitats and learned how to be an advocate to help motivate people to be aware of the negative affects on the ocean. Throughout the past 3 months, I’ve been learning so much about the ocean and I realized that there’s always something to learn about. In the beginning I was a little afraid about diving in the Bahamas because it was a whole new experience for me, but by the end of the trip I wished I could be diving in the Bahamas all year round. People think that the ocean is dangerous and fear going into the water, but I think the best way to learn is by getting hands on experience. I never thought I would love diving as much as I do now, and I can’t wait to continue diving and learn more about the ocean. 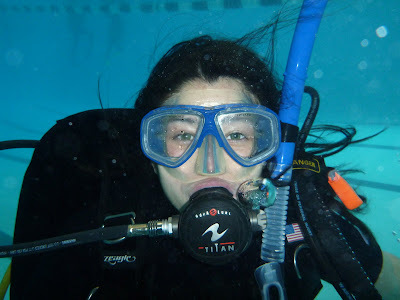 The 2011 Sea TURTLE teen diving expedition back in Boston. In this post, Porshai shares her final thoughts on her experience with the program. After seeing the ocean and its inhabitants with my own two eyes, I couldn’t believe how vast and populated the world was down there. Images do the ocean no justice. The beauty and calmness of the ocean is truly breathtaking! I have also learned about the effect that simple behaviors like taking a long shower, not choosing the most sustainable fish to eat, and simple education plays a big role on the oceans and its inhabitants, including the people that live on Bimini. Who knew plankton tows could be so exciting? More specifically, I have learned that the research, education, and outreach done by the aquarium greatly affect the Bahamas. For example, if educators didn’t explain invasive species (like lionfish) to me then I would have not been able to explain it to others. Ignorance is bliss and without education, some would go about daily life not considering that they too have an affect on the ocean. 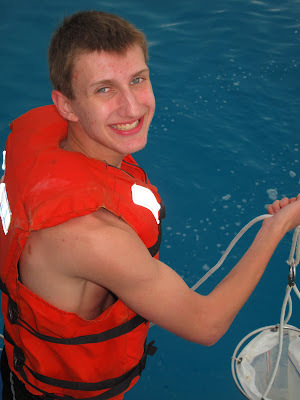 The 2011 Sea TURTLE teen diving expedition back in Boston. In this post, Lulu shares her final thoughts on her experience with the program. Ever since I was a little girl I have loved the oceans. I knew that they were the most beautiful place on Earth. They are Earth. 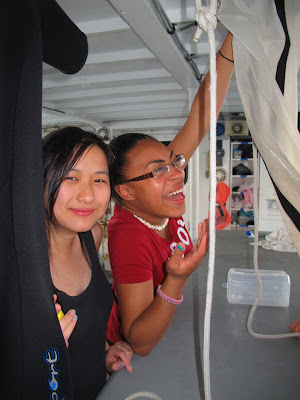 Lulu and Porshai with a pre-dive buddy check on the fantail. While growing up I have learned so much about the oceans. I have learned about the biology, the chemistry and the physics of the oceans. I have learned about the different habitats in the oceans, the history of the oceans, and the conservation of the oceans. However, I never got the chance to get up close and personal with them (besides going to the beach and splashing around in the waves). A brittle star, on of the many reef residents we saw. This trip was a chance for me to really experience what I had learned in the classroom. Being able to experience and see everything for myself was the most amazing experience of my life. No matter how many times I have read or been told how amazing the oceans are, I never fully understood until now. The 2011 Sea TURTLE teen diving expedition is back in Boston. In this post, Josh shares her final thoughts on her experience with the program. My perspective on oceans has changed being part of Sea TURTLE. Shore leave: Josh and the Sea TURTLES exploring the beautiful student garden at the Bimini All Ages School. Living in Massachusetts I have many luxuries and things that I didn't have down in the Bahamas. I feel like I have a more gentle approach on how to help the ocean. I have come to realize that taking shorter showers isn't so bad and being dependent on my phone and computer was taking me away from the beauty of the world. 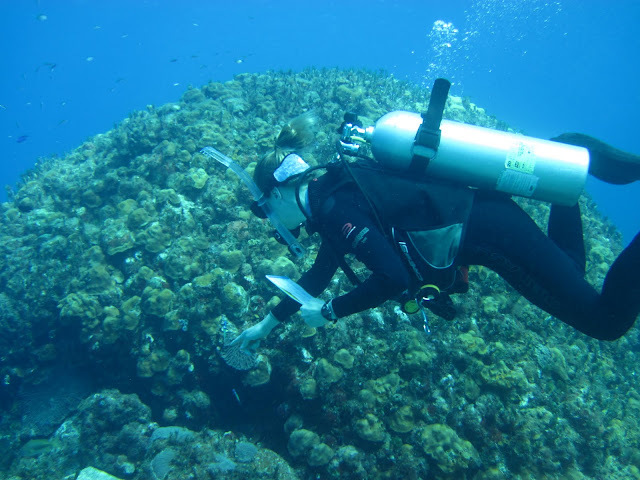 Josh identifying animals underwater for a REEF (Reef Environmental Education Foundation) fish survey. I view the ocean as an essential part of human existence and helping and taking action now will help to secure the future of our world. 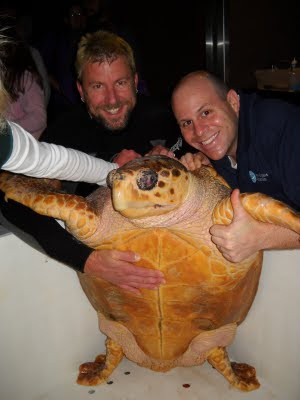 The 2011 Sea TURTLE teen diving expedition is back in Boston. In this post, Denise shares her final thoughts on her experience with the program. I’ve seen a huge difference between the habitats in Boston and the habitats in the Bahamas. It’s pretty sad to see that our beaches don’t look as beautiful. I have also realized that I get really sensitive when people throw things in the ocean without thinking what it could do to the animals in the water. I know that not everyone will understand why the ocean is very important to us but hopefully young teens will take action based on what they have experienced and learned and make a change everywhere. Team Plankton Tow: Christian, Jess, Denise and Michelle! I also made incredible friends now I can say they’re more like a family to me.